Most cases of acute bronchitis only last a few days with a cough that may longer for weeks. Patients who smoke are likely to experience a longer illness than those that don’t. Most patients will seek out medical attention for bronchitis. Sometimes it is necessary and sometimes it is not. However, discerning between the difference can be difficult. Usually, bronchitis settles in just after the common cold, right after the coughing and stuffy nose abate. 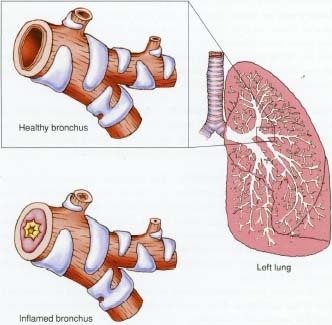 Bronchitis is very common. Most people experience the illness at least five times in their life, and in most cases, it disappears within weeks of the onset. However, some people develop bronchitis several times a year every year. Cases like these require a closer look by a physician. The most obvious symptom associated with acute bronchitis is a cough that renders either yellow or greenish mucous. Any mucous that isn’t either white or clear is usually a sign of infection. Any coughing that leads to excessive discolored mucous for more than three months is considered chronic bronchitis. Soreness, constriction, or burning in the chest, sore throat, chest congestion, fullness of the sinuses, wheezing, shortness of breath, fever, chills, and general fatigue and malaise are the general symptoms associated with bronchitis. The same virus that strikes down patients with the common cold is the same virus that strikes down patients with bronchitis, which is usually why many patients tend to get it after they have had a cold. However, cigarette smoke (second hand or first hand,) and environmental pollutants can also cause bronchitis. Bronchitis can be brought about by the reflux of acid in the stomach, usually called GERD. In some cases, if an irritant brings on the bronchitis, the situation will not clear up until the patient no longer experiences the environmental effects. Risk factors for bronchitis include low resistance brought on by previous illness, poor nutrition, or an under developed immune system, GERD, and chronic exposure to some irritants. People who smoke or those who live with smokers develop bronchitis nearly ten times more frequently than non smoking households. Children who are chronically exposed to second hand smoke also develop bronchitis regularly and often develop chronic bronchitis. An x-ray and a sputum culture are usually used in the diagnostic process after a thorough medical examination. It is not unusual for physicians to be able to determine immediately that the cough they hear is bronchitis even before the patient speaks. Most of the time, the risk of complications is very limited. However, infants, smokers, the elderly, and anyone with an under developed immune system or weakened state of health may develop pneumonia. Repeated bouts of bronchitis are often a key sign of another health problem or an unhealthy work or home environment. Patients should seek medical advice if they can’t shake their bronchitis within three months or if they get more than two cases in one year. Most treatment options are limited. Patients should get ample rest, drink plenty of fluids, and rely on over the counter cough medication to ease their discomfort. In cases where asthma is already present, an inhaler and prescription cough medicine might be in order. Patients who can not find relief within 48 hours should contact their physician for more aggressive therapies. Antibiotics are useless against bronchitis and should not be prescribed. Preventing bronchitis is not always possible. However, avoiding second hand or first hand smoke, living and working in an irritant free environment, an annual flu vaccine, and the use of hand sanitizers can help decrease the chances of coming down with bronchitis. Environments that are damp and dirty combined with cigarette smoke can make it more likely that the patient will experience bronchitis. The use of a humidifier in the patient’s bed room may help to alleviate some of the discomfort. Plenty of sleep is necessary to allow the body to heal and fight the virus. Some patients find that irritants such as cigarette smoke, allergens, and dust and dander make their symptoms much worse. The use of over the counter medication is recommended for most cases of bronchitis. Prescription medications with narcotic cough syrup can often help alleviate the feeling of the chest being compressed and the feeling of being unable to breathe. Inhalers can also help to open the airway. Trusted dedicated online pharmacy to buy viagra and cialis in south africa · Specially selected generic ed tablets such as cialis australia · and Buen lugar para comprar cialis en españa.